How about these beauties? The tubes are gorgeous! Not a very well known type – 6C5, but it’s a drop in replacement of 6J5, which in itself is a 1/2 of 6SN7 tube. Great thing about these tubes is that some incredibly sounding tubes are still available and not at a very high price of 6SN7 tubes. The tube have black round plates, that is surrounded by silver mesh shield to reduce noise and other unwanted interferences. 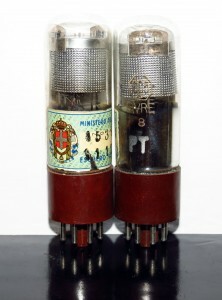 Sound is very similar to 6J5GT tube from Fivre. It’s a bit more transparent, but a bit less musical. Very cool tube!